This is the day that Charles Lindbergh landed in Paris, after 33+ hours alone in The Spirit of St. Louis, the day that changed his life and the world forever. 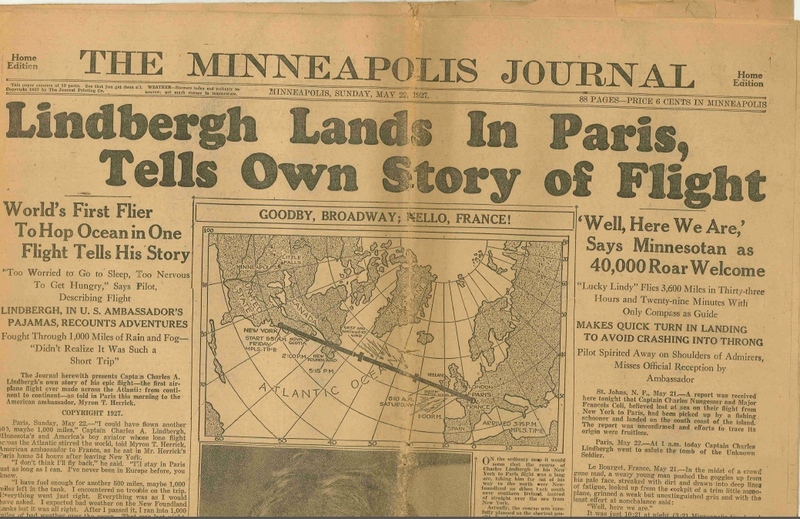 Lindbergh was indeed in pajamas when he told his story at the American embassy to a small group of reporters, but later he would telling even more of it in an exclusive deal with the New York Times. What’s interesting here is that the newspaper is selling the fact–repeatedly–that it has THE story, and that its Lindbergh’s own. Clearly, readers of newspapers in the scandal-ridden days of 1920s “ballyhoo” had come to expect quite the opposite–flamboyantly embroidered stories of celebrities and crime. Here, the paper announced, was going to be the Real Thing. This entry was posted in 1927, Aviation, Charles A. Lindbergh, Media & journalism by jbrianh. Bookmark the permalink.